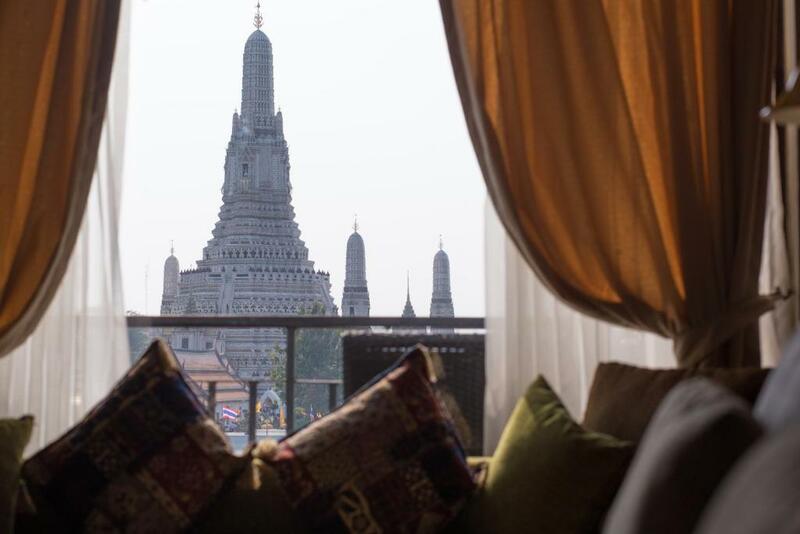 The view of Wat Arun from our room was breathtaking! Very good a/c in the rooms during hot days in the city. Room was spacious. Views from the property are pretty special. I like the ambience of the hotel. Wat Arun is very beautiful from a distance. It is good for couples. Great view from the room. Cozy and clean however the weather is too warm to enjoy the rooftop bar. Location for tourist, near Wat Pho, Grand palace and can view Wat Arun (opposite river site) without obstruct. The food in the restaurant was amazing and the staff were super helpful! 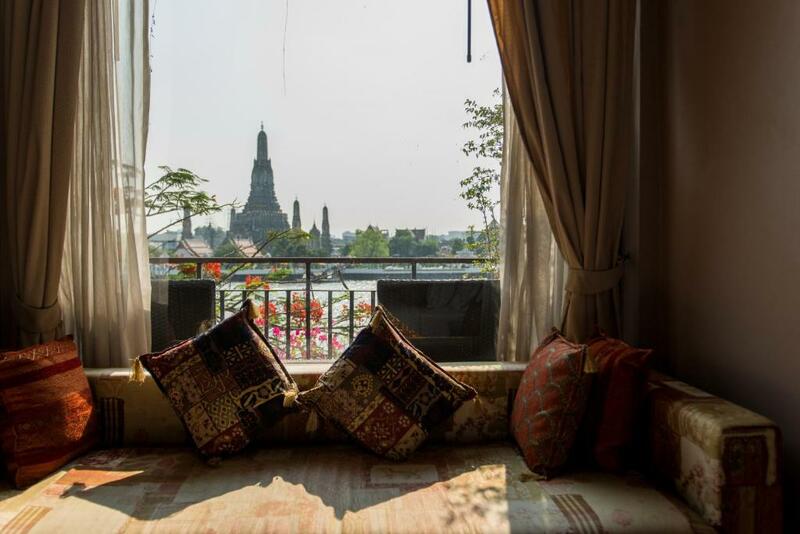 It’s in a great location close to the main temples and sights but also a tuk tuk ride away to the busier parts like china town etc for you to dip in and out. Would highly recommend! Perfect location. Amazing view. Comfortable room. Delicious breakfast. Lock in a great price for Sala Arun – rated 8.4 by recent guests! 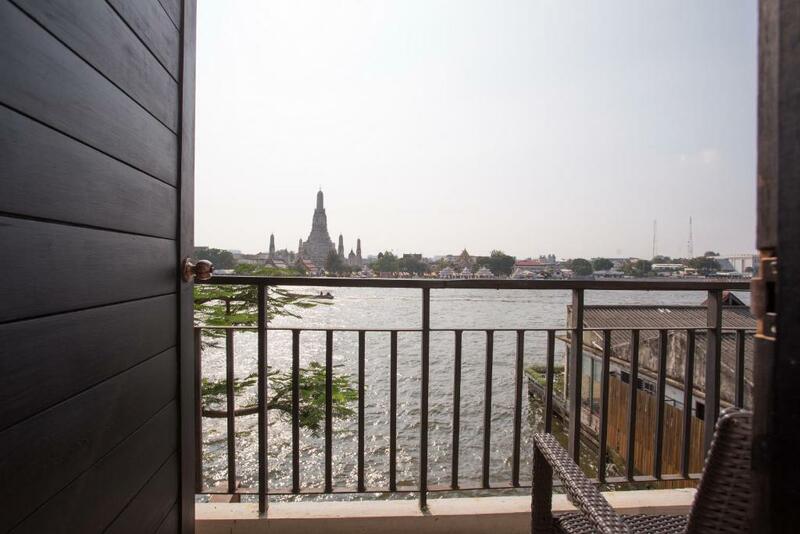 Sala Arun This rating is a reflection of how the property compares to the industry standard when it comes to price, facilities and services available. It's based on a self-evaluation by the property. Use this rating to help choose your stay! One of our best sellers in Bangkok! 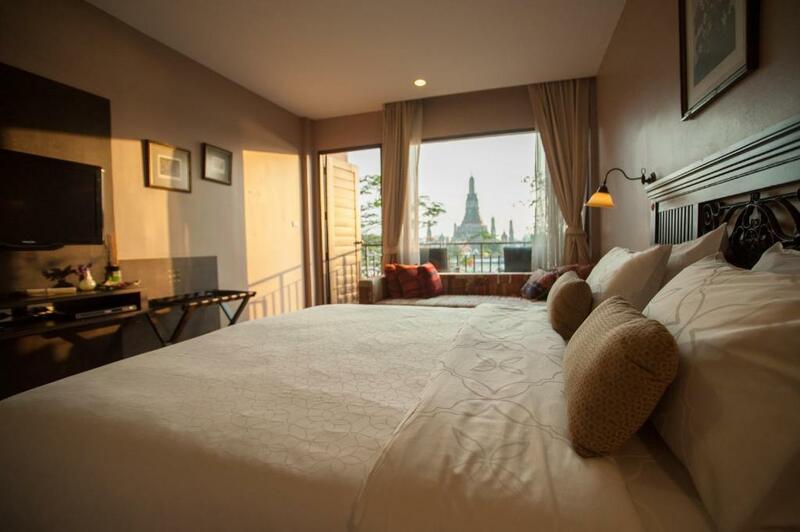 Sala Arun offers stylish air-conditioned rooms with direct view of Temple of Dawn or Wat Po from a private balcony. The Flower Market is a 5-minute walk from the hotel, and a 10-minute drive from the famous Khaosan Road. 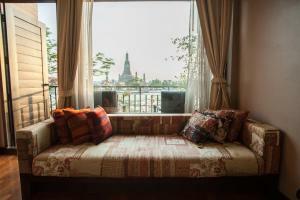 The property is 350 feet from Temple of Reclining Buddha. Temple of Dawn is located on the other side of the Chao Phraya River, which can be reached by a river taxi from Tha Tien Pier number 8. Grand Palace is 0.7 mi from the hotel while Suvarnabhumi Airport is 25 mi away. 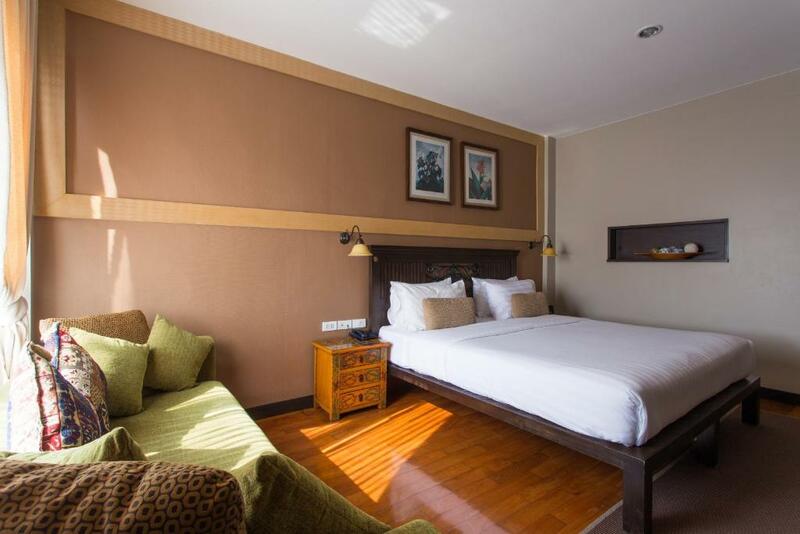 Rooms at Sala Arun are furnished with contemporary decor. Each nonsmoking room features a flat-screen TV, a mini-bar and a safe deposit box. 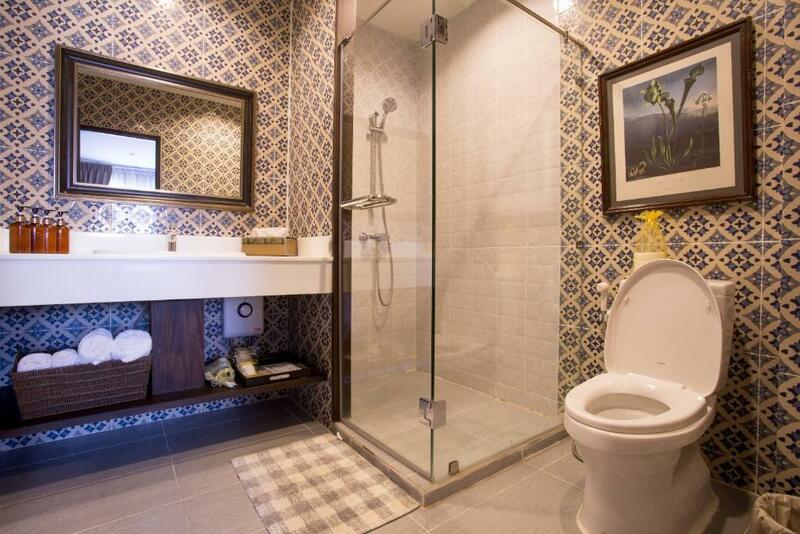 Shower facilities are included. For guests’ convenience, the hotel provides laundry services and luggage storage. A chargeable airport shuttle can be arranged upon request. The Bitter Deck offers a la carte menu with a great selection of Italian, French and Thai cuisines. When would you like to stay at Sala Arun? Air-conditioned room features view of Temple of Dawn from a private balcony. It has a flat-screen TV, a mini-bar and a safety deposit box. Shower facilities are included. - Get free drink and enjoy at the our rooftop bar Eagle Nest & Amorosa with spectacular and stunning view. 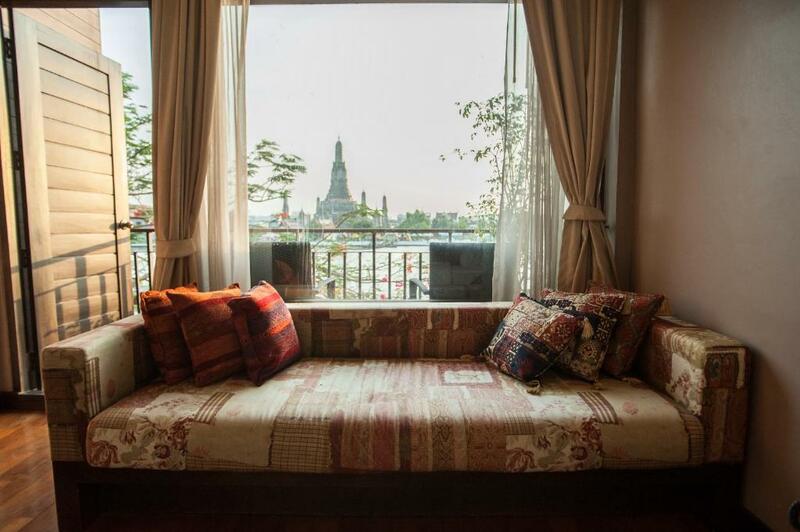 This room features views of Wat Po. It has a flat-screen TV, a mini-bar and a safety deposit box. Shower facilities are included. Benefit from Stay with us. Get discount 15% for food from our restaurant as below; – The Deck restaurant – Bitter Deck restaurant – Eat Sight Story restaurant – Get Free welcome drink for 2 persons at the our rooftop bar Eagle Nest & Amorosa is very nice and stunning view. House Rules Sala Arun takes special requests – add in the next step! One child from 2 to 12 years is charged THB 275 per person per night in an extra bed. One older child or adult is charged THB 750 per person per night in an extra bed. Sala Arun accepts these cards and reserves the right to temporarily hold an amount prior to arrival. Please inform Sala Arun of your expected arrival time in advance. You can use the Special Requests box when booking, or contact the property directly using the contact details in your confirmation. If you want to be close to tourist sites, it’s a great location. But not really near anything else. Before arriving there, I was trying to book a table in the rooftop bar but I was told there is no need for booking a table and I can go there at any time. Once I got there and I asked for the rooftop bar I was told it's too busy and I have to come back some other time. The room was on the fourth floor with the air conditioning equipment for the whole floor on the balcony outsid e our window.there was a roof bar directly above our room that did not close until 1am. To access the bar the stairs were the same stairs as the hotel with a spiral staircase to the roof. The toilets for the bar adjoined our room. It was very noisy especially at closing time. The toilet and bathroom had a foul smell which came into the bedroom if the door was not closed immediately..the room was not very clean. if we had been staying longer that our two nights I would have considered moving. The staff were extremely helpful and attentive..the breakfast was very good as was the restaurant in the evening. It was quite noisy but that was due to the traffic on the river. We also found a cockroach in our room just as we were leaving. Dirty Windows, generally not very clean rooms. Few restaurants in the area that were open after five They really need to change the music at Eagles nest. The hotel is a little old, rooms, carpets, doors. 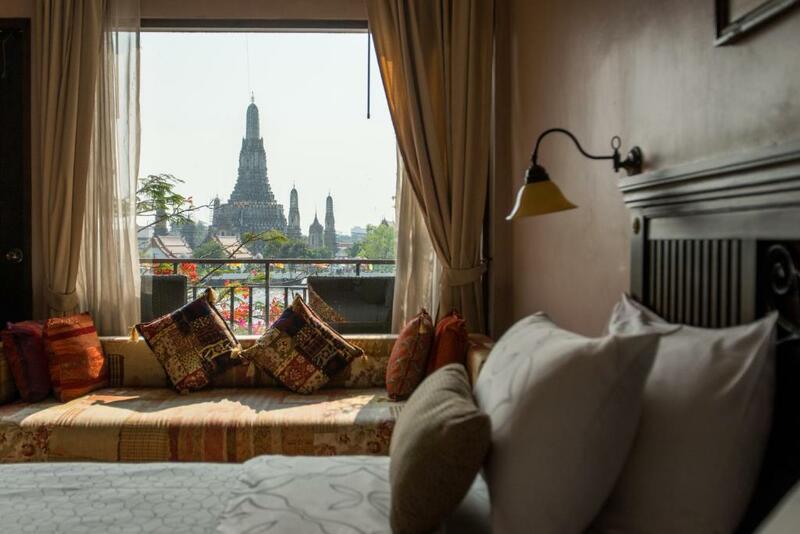 The views are outstanding, wake up to the sigh of Wat Arun from your bed. Also very nice roof top bar. Breakfast and food options are good. Good coffee. Walls are quite thin so you can hear your neighbours banging around and also hear the music from the bar (our room was directly underneath). 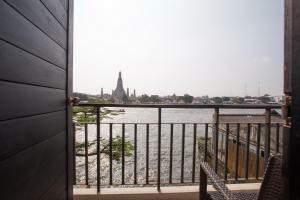 Fantastic location & a stunning view over Wat Arun (especially from the rooftop bar at night). Nice room with AC & a bathroom with a hot shower & good amenities. Thai beds are often a little hard. Some small maintenance issues.. The location and the views from the riverside rooms, the restaurant and the rooftop bar if you can get a seat. Nice staff and good food. Great breakfast. Told at quarter to nine they wouldn't serve us anything other than rice or pasta dishes by the member of staff in restaurant so ended up having to go elsewhere for food. Was told we could have the room until half 12. Room keeping staff asked us to leave at half 11. Was alot of cockroaches outside the hotel. The view was amazing and room was nice and reception staff were fantastic. Breakfast service was appalling it took 20 minutes to serve our ordered hot food .we where on a right time as we where due to leave at 8am we where sat at 730 and got no coffee or food for 20 minutes .